Option "Store bookmarks to a .PBF file" is checked. But besides PBF files bookmarks in bookmark menu are also stored. Are there any way to disable them and keep PBF only? I'm sorry but It's not clear what you're talking about. You can turn off the lists in menu. Try the latest beta. Installed latest beta. Same story. Cannot find the menu to turn them off. It is in bookmark menu. Last x32 beta installed. Bookmark menu snapshot is done, all strings are numbered. Expected: Should be switch to disable bookmark records in ini/registry. Bookmarks are stored in PBF files. Actual: Can't find the switch. 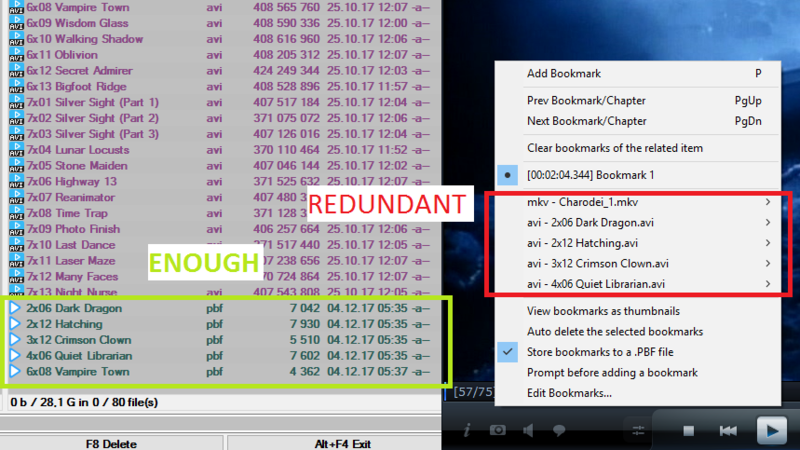 Expected: After item "Store bookmarks to a .PBF file" records in red rectangle should dissappear. Actual: They exist all the time and each one needs to be deleted manually. Records in the red rectangle are sure not taken from PBF, because if PBF are deleted, records are alive. Expected: Should be a switch to store bookmarks INI/Registry list <--> separate .PBF file for every video file. Actual: Bookmarks are stored in INI/REGISTRY, and can be dublicated into .PBF. Disabling "show bookmark lists" turn off the lists. You are misunderstanding something wrong. Probabaly due to wrong translation of menu. For example, "Store bookmarks to a .PBF file" is one of arbitrary translations. 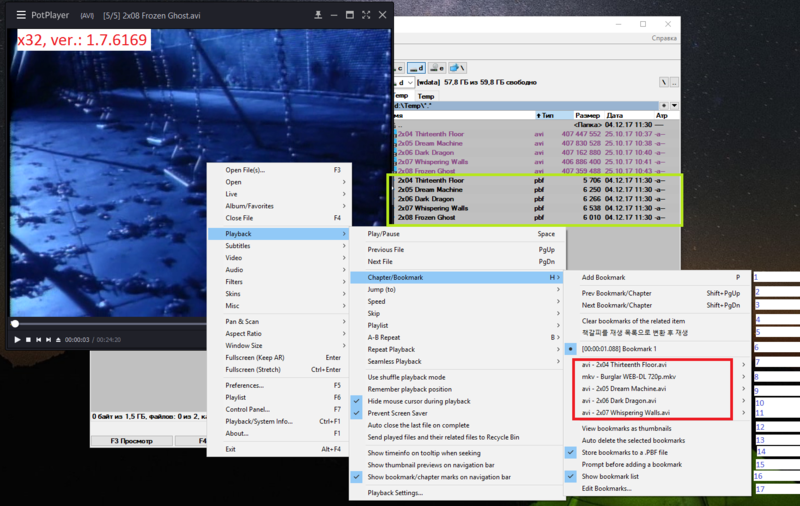 It should be something like this: "Save bookmarks in the same folder as videos"
bookmark menu - 2nd item from the bottom. Bookmarks are stored but not shown any longer. is there anyway to prevent storing of the bookmarks in the ini file completely? even though i cleared the list, if I disable "show bookmark list," and I use files normally with their bookmarks, if I go back and enable "show bookmark list" it shows all the bookmarks I had used previously. I've already disabled history use, why can't I disable history for bookmarks as well?